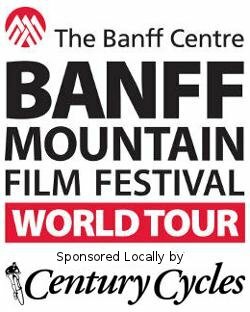 Century Cycles is proud to be the exclusive local bicycle store sponsor of the Banff Mountain Film Festival Word Tour in Cleveland for 2012! The tour brings the world's top films in mountain culture, environment, and adrenaline sports to Northeast Ohio for the 15th time! Saturday, April 14, 2012 - Reception at 7:00pm, featuring coffee and desserts. Films begin at 8:00pm and end around 11:00pm with an intermission. Tickets: $22. Advance tickets can be purchased at any of the three Century Cycles stores in Medina, Peninsula, or Rocky River. A $1 per ticket processing fee will be charged for ticket purchases made with credit cards. Ticket prices will increase $5 each on Friday, April 5, 2012. The reception on both evenings will feature exhibits by Century Cycles and other organizations of interest to outdoor enthusiasts, plus sign-ups for door prizes! On The Edge Films, Inc. brings the Banff Mountain Film Festival World Tour to Cleveland.